Home Everything Tech Can the city of pizza reinvent itself as a tech capital? As tech giants Apple and Cisco set up academies in Naples, the city’s tech entrepreneurs are hoping new investment will revitalise southern Italy’s failing economy. Naples is a city with a reputation: it has pizza, its very own mafia known as the Camorra, and devil-may-care drivers. But in the past few years this southern Italian city has also been fostering a growing community of tech start-ups and app creators. The hope is it will change not just Naples’ reputation, but also its fortunes and so reverse a brain drain that’s seen many of the city’s young graduates leave to find jobs in the more prosperous north of Italy, or even abroad. 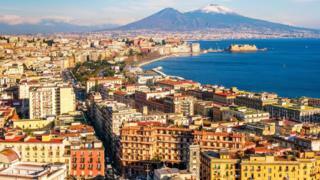 Naples, and its region, Campania, is part of the Mezzogiorno (southern Italy and Sicily) which lags behind the rest of the country in terms of economic growth. Here the jobless rate was 22.2% in the first quarter of this year, almost double the national average. Naples is famous for its oven-baked pizzas, but can it become famous for tech innovation? But that hasn’t put off a growing list of Neapolitan tech firms – influencer marketing company Buzzoole and the agricultural tech start-up Evja to name but two. Evja makes sensors that are placed in fields and greenhouses to transmit real-time indicators of growing conditions. “We want to prove it’s possible to do business here,” says Evja founder Paolo Iasevoli, pointing out that his company is now selling overseas and soon launching in south American markets. What has really changed the game for Naples’ tech scene is Apple’s recent arrival in the city. In 2015, Apple opened an academy in Naples, in conjunction with University of Naples Federico II, where students spend a year training to be developers, coders, app creators and start-up entrepreneurs. This year nearly 400 students graduated from it, about 70% of them are Italian and the majority come from the Campania region. A further 400 students are due to start the academic year later this month. Apple thought it could make a far bigger splash in a place like Naples than in some of the more established tech hubs of Europe, such as Lisbon, Dublin or Berlin. And where Apple goes, others follow. Earlier this year, networking giant Cisco opened its own networking academy in Naples. That’s helped provide a steady supply of skilled graduates. But setting up a tech business in Naples was anything but easy for Mr Iasevoli, who founded Evja three years ago after securing investment from shareholders in Munich and Vienna. “We had major issues accessing credit from the banks, major issues getting funding from the government,” he says. Despite these obstacles, Mr Iasevoli chose to stay put. Tech sector salaries in Naples are just half of what someone in London would expect, he reckons, and the cost of living is cheaper, too. Apple’s presence has also made the job of promoting the region easier for Valeria Fascione, Campania’s minister for internationalisation, start-ups and innovation. She is the only regional minister in Italy with such a role, she says, proudly stating that Campania now has Italy’s second-fastest growth for start-ups. But while Apple and Cisco’s academies have been great news for young graduates and Naples’ image, it hasn’t prompted the inflows of private capital some had hoped for. As a region, Campania receives some of the lowest investment in the whole of western Europe. Most of Italy’s economic activity happens up north – Milan is where the venture capital firms are based. Which is where Giovanni de Caro comes in. He’s worked in venture capital for the past two decades and sits on the board of Campania NewSteel, the University of Naples’ tech incubator, which occupies the site of abandoned steel mills outside the city. “The companies are here but the money is not,” says Mr de Caro, a Neapolitan himself. These days, he describes himself as Campania NewSteel’s “finance man”, and says cultural barriers between the north and south are a problem when it comes to enticing Milan-based capital down south. “Southern Italy works very differently to the North,” he says. Critics often point to roads riddled with pot-holes, slow trains, poorly delivered public investment. No wonder private capital chooses to stay away, they say. But then there isn’t much of a pool of venture capital funds in Italy anyway – the sector is about a tenth of the size of London’s. What Italians do have though is a very large and wealthy diaspora, one which Nicola Garelli’s company, Istarter in London, is tapping into. The idea is to attract Italian-born capital back home by appealing to a sense of patriotism. Participants, “have a strong sense of giving back towards the country,” says Mr Garelli, himself an Italian. Istarter has invested in nearly 40 tech companies in Italy – but, again, none of these are in the south. Britt Becking, of venture capital firm QVentures in London, says there just isn’t a buzz around the Naples tech start-up scene in the same way there is around tech start-ups in, say, Berlin. It’s a chicken-and-egg situation: the private money won’t come until there’s an established tech scene, but start-ups can’t get established without access to capital. “I would recommend [Neapolitan] start-ups try and go to London, Berlin, Silicon Valley,” she says. But that’s exactly what firms like Evja and Buzzoole don’t want to do. Investment here goes much further with far greater potential for big returns, they say, adding that venture capital firms are missing the point. “If we had started in the US – somewhere like that – we would have needed $10m or $15m, but we did it with less than €3m here in Naples,” says Fabrizio Perrone, Buzzoole chief executive and founder. And for Evja’s Paolo Iasevoli it’s a badge of honour to do it all from Naples. Naples, whose name derives from the Greek “neapolis” meaning “new city”, has had to reinvent itself many times throughout history. Over the centuries it’s been the capital of duchies, kingdoms and empires. Could it become a new capital of tech?